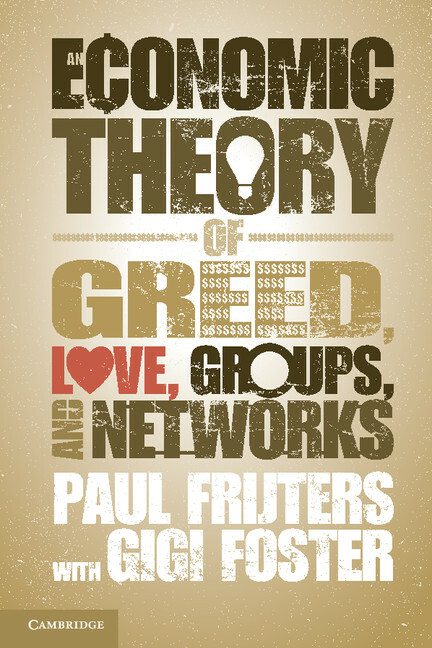 Paul Frijters and Gigi Foster talk about their new book, An Economic Theory of Greed, Love, Groups, and Networks, which offers a new theory of economics that incorporates love, groups, and networks into the classic greed-and-market framework. Real life has emotions, power, and groups in it. People love, hate, vote, believe, and make mistakes. We feel and are drawn to stories of feelings. As they say in the media: “if it bleeds, it leads.” Similarly, politicians regularly play on people’s feelings of patriotism to gain support for new policies, and this strategy often works. Yet the main story economists tell of how their society works is cold. It is one in which people are heartless smart calculators: caring only about their own material gain and not that of others, they see everyone else as either a potential trading partner and/or a potential competitor. There is a beauty in this, to the extent that Economic Man is willing to cooperate with any race, religion, or creed, if doing so advances his material aims. Pitted against each other in a market where they can only out-do each other through their productive activities, Economic Men produce economic growth as well as good institutions that keep everyone honest and peaceful. Economists have recognized that they were leaving the world of emotions out of their story of markets and material self-interest, but coming up with simple theories that do justice to these aspects of real life while also retaining the simplicity and practicality of the main economic story has been a challenge. Adam Smith, Alfred Marshall, and even Karl Marx all spoke about emotion. “Moral sentiment” found its way into the title and topic of one of Smith’s great works. Marx’s dialectical materialism is built on the notion of class identification—i.e., emotional commitment to groups—and the entire Communist experiment proposed that people’s emotional commitment to the success of their group could, in the long run, trump their desire for personal material advancement. Modern economists also have opinions about the realm of the heart. Household economists have implicitly recognized the emotional bond between mother and child in driving parents’ resource allocation decisions; experimental economists have tested the robustness of people’s “other-regarding preferences” (read: their emotional attachment to others); and behavioral economists have even gone so far as to sprinkle emotional components into utility functions. Modern economics is now awash with stories of people’s attachment to what they have (“endowment effects”), their “irrational” anger at past slights, and the “market sentiments” that flared up in the global financial crisis. What new framework can we economists offer to policymakers and the general public that includes an emotional component? But with the recognition that there is more to humans than just calculating material self-interest comes the question of how it all fits together. The standard economic story of markets and self-interest offers an appealing, simple picture of society as a whole. If we open up this standard story to incorporate the emotional content of elements that the mainstream story has to bend over backwards in order to fit, like religion, nationalism, democracy, human rights, sacrifice, and mental health, then what new framework can we economists offer to policymakers and the general public that includes an emotional component? In our new book, An Economic Theory of Greed, Love, Groups, and Networks, we offer a new framework while retaining the simplicity and practicality of the economic mindset. We generate simple theories of love, of power, of groups, and of networks, and fold them into the existing economic story of greed and markets. In our book, Economic Man loves, forms groups, applies power, and feels emotion because it ultimately advances his interests; but the feelings are now real and our Economic Man cannot choose overnight to stop loving, to walk away from his groups, or to escape power. Picking what we think is the best of existing “behavioral economics”, as well as the thoughts and findings of psychology, neuroscience, sociology, politics, and history, we propose a new synthesis of society based on simplified understandings of these hitherto neglected bits. It’s no romance novel, but our book offers Economic Man a heart, a group, and a place in a power structure. He now feels, a bit.